Locksmith Sioux City, IA | Siouxland Lock & Key - Emergency Services Avail. Siouxland Lock and Key is the reliable locksmith company in Sioux City with the knowledge and experience to handle any type of lock with ease. We are proficient in dealing with lock combination changes and rekeying of all types of locks. Our expertise also allows us to create key copies for any type of locks to ensure no inconveniences are experienced with access points. Here at Siouxland Lock and Key, we understand that access to the secure places is paramount. As a result, we offer same day services for all lock emergencies. We guarantee that we are promptly stationed at the scene to offer our professional service and facilitate an effective return to normal operations. Siouxland Lock and Key stands as the local locksmith service provider in Sioux City with technical expertise. Our technicians can handle emergency car door unlocking, emergency ignition repair, residential lock replacement and overall key extraction for any type of lock. 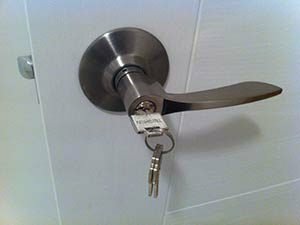 Additionally, we have the equipment that allow us to perform lock duplication, deadbolt lock installation and key generation for locks that have problematic access panels, in addition to our key replacement services. A high-intensity, action-packed movie about your frustrating situation could accurately be called Locked Out Sioux City. You’re probably late to an appointment, left the dog out of the kennel, or have ice cream melting in the trunk. Besides breaking the door or smashing a window, is there is there any hope of ever getting back inside?! Your local, reliable locksmith is on the way! A quick shout to (712) 258-4730, and our superhero is on the way! Is that a bird? Is it a plane? No! It’s a Siouxland Lock and Key professional locksmith pulling up to your location! Our technician will arrive in a fully-outfitted, locked-door defying super van! Faster than you can wipe another frustrated tear from your face, our friendly, reliable Siouxland Lock and Key locksmith will employ his super door-unlocking powers to get you in and on to happier days. As our hero drives off into the sunset, you’ll breathe a sigh of relief. If you're locked out in Sioux City don't fret! Our reliable Sioux City locksmith is on his way, anywhere- 24 hours a day. Monday through Sunday, during weddings or holidays, come rain, shine, snow or sleet, we'll be there. Our dedicated technicians travel the region, unlocking doors and getting you back into your home or vehicle. We want you to know that we can take care of you being locked out. Here at Siouxland Lock and Key, we enjoy helping people every day. Many people are at a loss as to how they should handle their own locked out situation. In their frustration, man people break into their own property. As a result, they spend money on repairs that could have been avoided by calling Siouxland Lock and Key. Our technicians know that all you want is access to whatever, or whoever, is on the other side of your locked door. We’re fully-trained and equipped to tackle lock outs of all kinds, with little to no damage to your home, vehicle or business. Siouxland Lock and Key is quick, professional and affordable, and we love being your go-to for emergency locksmith needs. We’re the Sioux City locksmith that can manage any emergency car door unlocking, emergency ignition repair, residential or commercial lock replacement, and key extraction for any lock. Additionally, we offer lock duplication, deadbolt lock installation and key generation for locks that have problematic access panels. Ask about our safe opening services. Go ahead, ask your friends and neighbors who the hero in their Locked Out Sioux City story is. We’re betting it’s our own Siouxland Lock and Key locksmith! Call Siouxland Lock and Key today at (712) 258-4730. Sioux City, IA 51103. Our regular office hours are M-F:8-5, Sat: 8-noon, Sun: closed.